You’ll find this Broadbeach accommodation on the beachfront hard to resist. The Sandpiper Beachfront Apartments are inexpensive, spacious and clean accommodation on the beachfront provide business travellers, couples and young families an excellent opportunity to stay and play in one of the nicest parts of the Gold Coast. At the Sandpiper Beachfront Apartments you’ll find everything you need and lots of space to spread out and relax. Our apartments come in one and two bedroom options. Lower floor apartments get a nice view of the park while higher apartments have views beyond of the Pacific Ocean to enjoy. Everything means; a fully equipped kitchen (stovetop, full-sized fridge, microwave and dishwasher), the fully loaded laundry is also welcome for longer stays and business people who need to have their attire clean and freshly ironed, yes we supply ironing board and iron for exactly that. Afterhours fun can always be had in Surfers, or in Broadbeach at The Star Casino. Black tie and cocktail dress or club wear. It’s your choice. 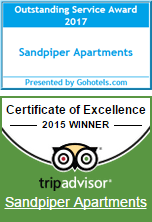 You always come back to a lovely private and peaceful abode here at the Sandpiper Beachfront Apartments. For the money and superb location this Broadbeach accommodation on the beachfront is hard to resist.